Hope you enjoy this little video I made of our adventures around the Divine Retreat Center as we walked out into the side streets in the town of Muringoor in Kerala India. It starts with a few minutes of my talk with the lizards on the ceiling over my head. Then we leave the retreat center to see the side streets with lots of faces, flowers, a beautiful church, traffic, fishmongers, and other fun things. Enjoy! I hope it gives you a small sense of being here with us. 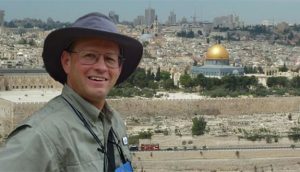 Steve Ray, who has been working for 16 years on the ambitious “Footprints of God” series, discusses his vision, describes the difficulties, and asks for assistance as the project nears the finish line. Author and apologist Stephen Ray (CatholicConvert.com) along with his wife Janet, entered the Catholic Church in 1994, a journey from the Baptist tradition to Catholicism described in Ray’s first book, Crossing the Tiber: Evangelical Protestants Discover the Historical Church. Since then he has kept busy with giving numerous talks, leading pilgrimages to the Holy Land, Rome, and other locations, and writing more books, including Upon This Rock: St. Peter and the Primacy of Rome in Scripture and the Early Church, and St. John’s Gospel: A Bible Study and Commentary. To visit our “Footprints Updates Page” or to help support the project financially – www.FOGHelp.com.